IoT Latin America is the most important B2B event on the IoT sector and focused in generating business in Latin America. 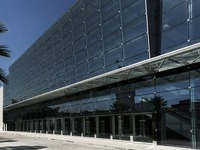 The trade show is part of the Technology Hub, an event that integrates technologies. With the aim of expanding their applications, IoT Latin America is a unique platform to truly connect to the marketplace, understand its challenges, its goals and create lasting business relationships, all in a prosperous, innovative and engaging environment where the main goal is for you to achieve tangible results for your business.